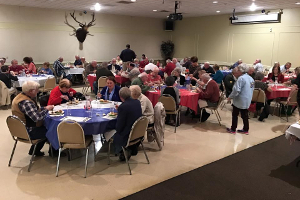 The Painesville Elks Lodge has seen many celebrations that involved Riverside Alumni. It is still a great place to throw a party. Our facilities are available to the public for rentals, meetings, and parties of almost any description. The rental menus are listed on this website on the Banquet Menu page. Weddings, birthday parties, anniversaries, and showers find a friendly venue at reasonable pricing.Call 440-357-6943 and ask for Bonnie to schedule a visit to our redecorated banquet hall. There is plenty of parking and we can accommodate groups up to about 200. We have a smaller room that can easily handle 50. Our in-house kitchen and staff are ready to serve your needs.